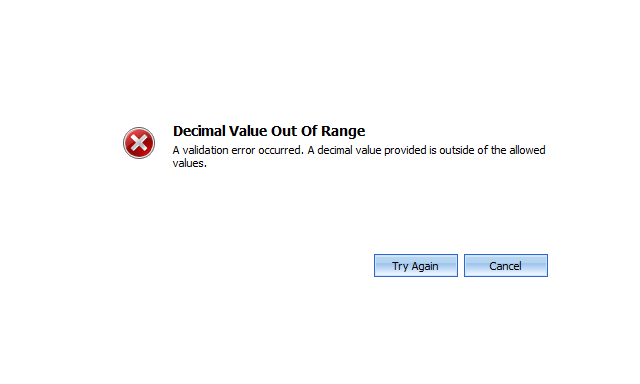 A validation error occurred. The value of ‘totalprice’ on record of type ‘contract’ is outside the valid range. At that point, all I had to do was try and understand why, what looked to be a valid total price on the Contract, was not. I decided to have a closer look at the Contract Lines and found the culprit. A Contract Line was $.01 more than the total value of the Contract. How that happened, I don’t know and since this was the first time I’d seen this type of error, I decided to move forward and get the issue resolved. After exploring a few options, I determined that I was not going to be successful using standard methods like leveraging workflows to update or cancel the contract, etc. so I decided to go the unsupported route on this one. I don’t recommend this and I generally do everything to avoid it but since this was a very odd data anomaly, it appeared to be my best option. To correct the issue, I completed a backup of the database and then ran a script on the contract and updated the totalprice and netprice field to match the value of the Contract Line. I could have chosen to match the Contract Line to the Contract as it would most likely have had the same effect. To complete the fix, I opened the Contract record from CRM, selected Actions, Cancel Contract and this time the Cancel request worked. Hopefully none of you will run into this odd issue, but if you do, you’ll have a potential solution that you can try. Of course, you can always open a Microsoft Support case as well and if it is deemed to be an application issue, there will be no charge for the Case. Previous Post: You Want That Form To Do What? I am facing the same issue. Any updates was this issue resolved in any of the roll-ups? I am facing this particular issue on the netprice value instead of totalprice. Since it was a data anamoly, I don’t believe it will be addressed in any update rollups. If you are experiencing this frequently, then I suggest opening a case with Microsoft Support.